Ready to move up without sacrificing space? AQUA is Midtown's hottest new boutique high-rise featuring unprecedented square footage. This glassy superstructure houses a swanky clubroom and units with unique floorplans. 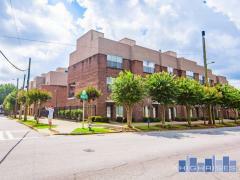 Enjoy private elevator access, Viking appliances, Kohler fixtures, exotic hardwood floors, thick granite countertops, oversized windows, & fantastic views of Atlanta! Have any comments or questions about AQUA? Ask your question and/or share your thoughts about this Building.